Officials at the ground-breaking ceremony held in Dubai. 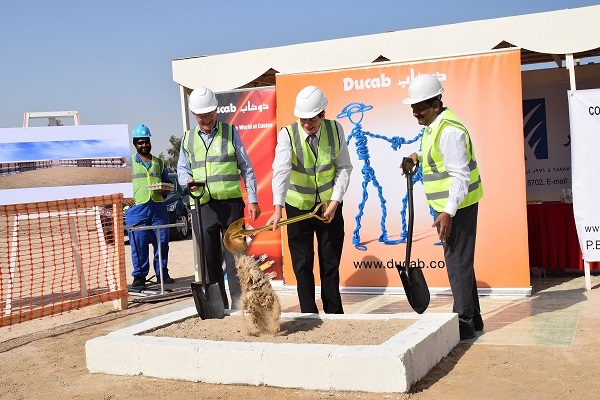 Ducab, a global leader in the manufacture of copper and aluminium wire and cable products, has broken ground on its newest accommodation facilities at Jebel Ali area in Dubai, UAE. The move is aimed at enhancing facilities for its own staff, said a statement from Ducab. The two double-storey blocks will be the first of their kind in the Ducab accommodation site. The new residential site will feature an amenity building with a laundry and a prayer room, as well as extra storage rooms and a recreational area. Each room will also have its own balcony. A joint venture between the Investment Corporation of Dubai and Senaat (General Holding Corporation, Abu Dhabi), Ducab was founded in 1979.